I had a concerning email today by a user who was upset that Autoblogger wasn’t posting unique content. Everything turned out to be a huge misunderstanding but it’s my fault for not explaining things well to begin with! Autoblogger works by researching your keywords and finding topics on sites such as Google News, Digg, Ezinearticles, etc related to them. 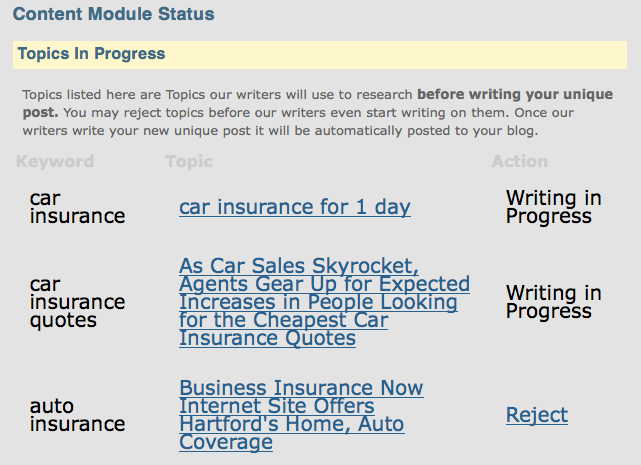 It then displays and lists these topics for you to review and reject if you choose… but that’s BEFORE our writers ever write your unique posts for your blog. Our writers take these topics and research them further, using them as an idea for your new 100% unique blog post. Once the posts are written our system then automatically has editors check over them, checks them through copyscape.com for 100% uniqueness guaranteed, then posts them to your blogs without you ever lifting a finger!